We create custom prosthetic solutions for our furry & scaley friends. 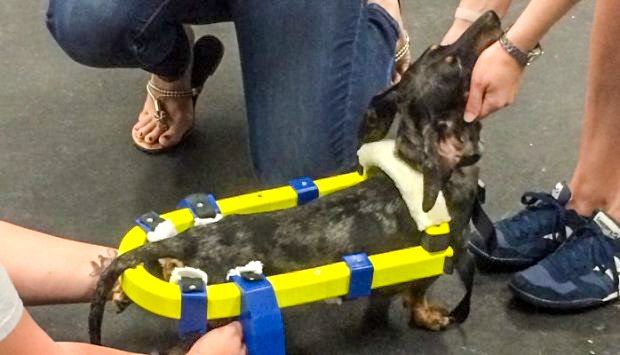 Our mission is to help animals from all walks of life who are in need of mobility devices. Our processes utilize traditional prosthetics practices along with cutting edge 3D printing and design to create functional solutions for our furry and scaly friends! In 2016 we will be obtaining our non-profit status so that we can help raise money for animals who have been victims of abuse, neglect and defect. Our non-profit arm will be a need-based process where applications and recommendations will be submitted to our board for review. Walter has had an incredible life in the last year...he is an amazingly special dog. He was found in early May 2017 in very rough shape. He was found by some caring local police officers and rushed to an emergency hospital.It was suspected that Walter's injuries were the result of being used as a bait dog for dogfighting. Walter's story could have easily ended here, but he was rescued by the team at Kenway's Cause who agreed to take him in and work to provide health care and assistance to Walter so he could recover and get back to being the happy puppy he should have been! Walter was in guarded condition when he was found. He remained in guarded condition during his first few days in the hospital. The veterinarian team felt that an amputation was likely, as an attempt to save Walter, but the weren't confident he would even make it. Then a very special veterinarian looked at Walter's case, and said she not only felt she could save him, but she would like to try to save his paw and leg as well. Dr. Racheal Currao, worked tirelessly to try to save Walter's leg. She uses special vacuum bandages with medicinal honey and countless other treatments. Unfortunately, Walter's right front paw starting to get very cold, which meant there was no blood circulating. he limb was dying. There was no other choice, she had to amputate. This decision was very emotional for everyone because they knew what it meant for an English Bulldog to only have three legs. 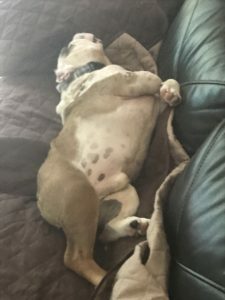 Most dogs do just fine with 3 legs, but because of the build of the English Bulldog, they are one of the few breeds that don't do well as amputees. Knowing this, Dr. Currao left as much of Walter's leg as she possible in hopes that he would be a candidate for a prosthetic leg. Kenway's Cause was in complete agreement. So a partial amputation was done on May 15, 2017. 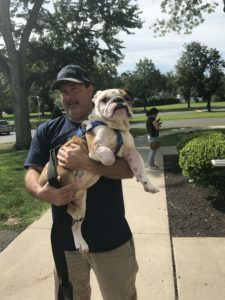 Walter spent 24 days in the care of an amazing veterinary team at Veterinary Specialists of Connecticut. One of these team members was a vet tech named Bobbie. 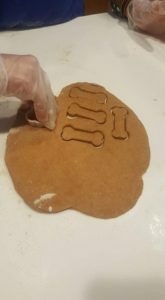 Bobbie is a certified canine rehabilitation technician with a background in human prosthetics, she reached out to an old connection, Pawsthetics, which is our group based in Colorado. She began the inquiry process into having a device be made for Walter. On June 1st Walter left the vet to go home with his foster parents, Sheri and Jerry, to continue his recovery. Walter had visits with Dr. Currao every 3 days to have his wound cleaned and bandaged changed. 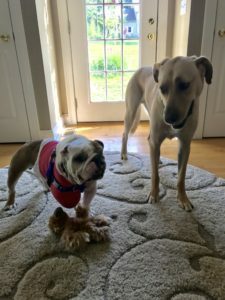 Finally, Walter was medically cleared, his bandage was removed, and he was officially adopted by his foster parents, and four canine siblings. Pawsthetics has been consulting on this project since the late Summer of 2017. We had initial casts taken of his leg in the Fall and delivered devices to Walter to try on. His leg was still healing and it had changed shape from the cast, so we all rushed and edited his designs once again based on a new cast and sent them before the holidays last year. Our latest edits of the devices went out in March of 2018 and featured a new design and hardware to help make it easier to get onto Walter's frame. 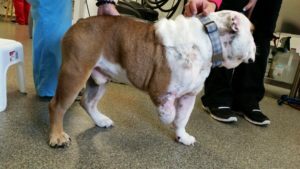 While we have gotten the devices to fit Walter and he has taken some steps in the Pawsthetics devices, we know that we still have work to do to help keep the devices on his body while he walks and runs. We have learned so much from each device we have sent and we feel that we are very close to getting Walter to a more permanent solution that is good for Walter and keeps him happy and healthy for years to come! 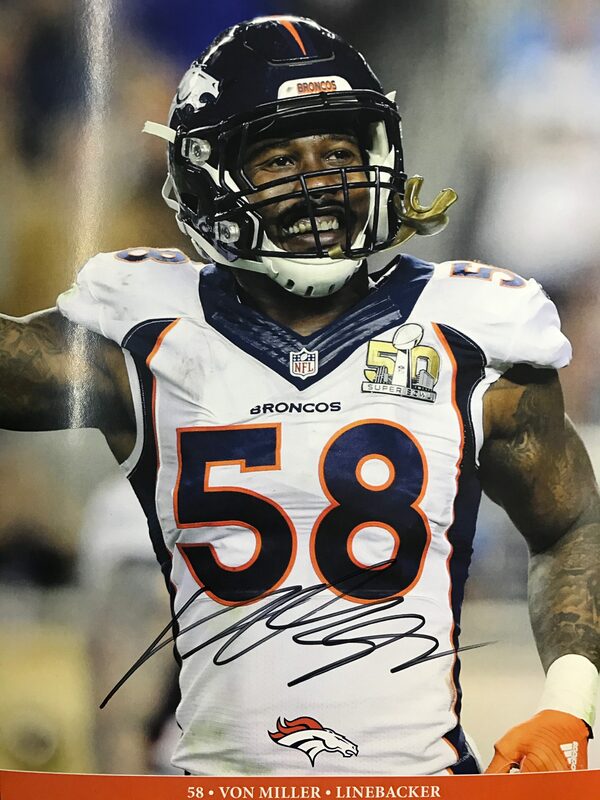 There has been a lot of help along the way, including fundraising efforts by Colorado Girl Scout Troop #59. 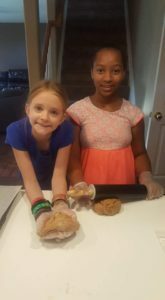 The girls made dog beds, dog treats and other crafts to sell at a local craft fair during the holiday season last year. 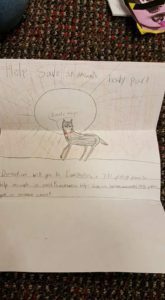 They also sent letters out to local veterinary offices and received donations from them for Walter's care. -We are hoping to raise a goal of $1500 to help cover the costs of Walter's additional fittings and future devices. -We are continuing our work and hope to have Walter in a permanent device that will last atleast 6 months or a year, only wearing out due to use. 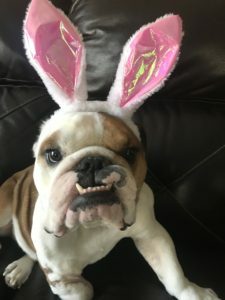 -We will use techniques from Walter to increase the chances for other similar dog breeds in need of prosthetics as Bulldogs and similar can be challenging. -YOU! 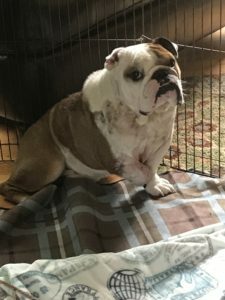 Please donate to Pawsthetics to help us continue helping Walter and helping to provide solutions for his future prosthetic needs! 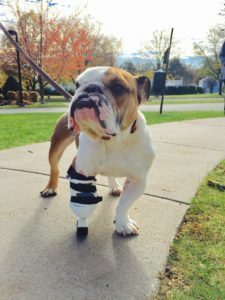 -We use cutting edge 3D printing, Scanning and CAD technologies to build prosthetic solutions for animals in need all over the World! We are a 501c3 who seeks to provide need based requests to benefit animals in rescues, rehabs and who have been recently adopted. We are very happy to announce that Pawsthetics is finally an official 501c3! We are launching a Fall Fundraising drive to help kick off 20 projects that we have in different phases of completion for animals all over the World! Our goal is to work with rescues, shelters, owners, vets and animal lovers World Wide, to help better the lives of animals in need. Our efforts are intended to provide creative solutions to help animals walk, roll or just to generally improve their lives. We use all available technologies to create these solutions. Often times we have to work with consultants and experts and we are hopeful to be able to offer them some payment in return for their time and expertise. Many have already donated hours and hours of time to help. We have a full design team ready to develop a solution for your favorite animal in need! We have worked with great rescues all over the country and beyond! Please help us to continue to grow our outreach and abilities to serve more animals in more places. Your donations, interest and support all help to make our mission possible! Meet Martini! Our First Brand Ambassador! A small dog with a big heart! Martini was born without full and functional front legs leaving her at risk of a number of health problems as she began to grow, including sores and infections, further deformity and stress on her head and neck from supporting her body on two legs. Luckily Martini was adopted by Gaylan, a former professional animal trainer, who never saw Martini as anything other than a dog in need of love. She worked with Martini over time and it became obvious that Martini would need a bit more support to help alleviate the stress on her body. Gaylan began researching prosthetic carts and made a great connection with Wagaware, the awesome company who raises money for pet rescues all over the US! Wagaware connected Gaylan and Martini with Pawsthetics and the three groups formed a team to help get Martini more comfortable and moving in a healthier way. As Gaylan recounts, "it takes whole hearts to help animals who aren't whole and Pawsthetics and Wagaware understood Martini's needs and we are excited to continue working with them both!" 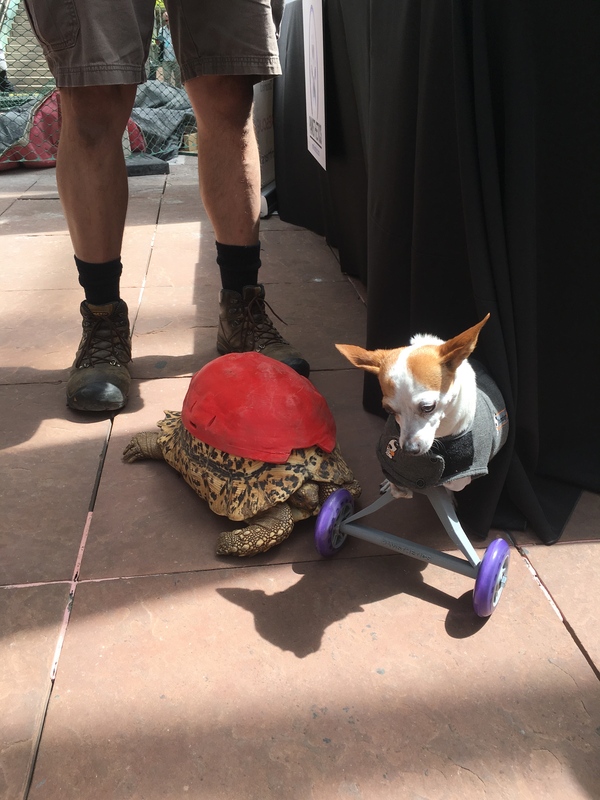 Martini visited Denver back in June of 2016 and she was given the title of "Brand Ambassador" to help spread the word about Handicapable animals in need! She and Gaylan have been outstanding supporters of the Pawsthetics cause and have gone above and beyond to support other dogs in need. We are so happy to have them as a part of our team! 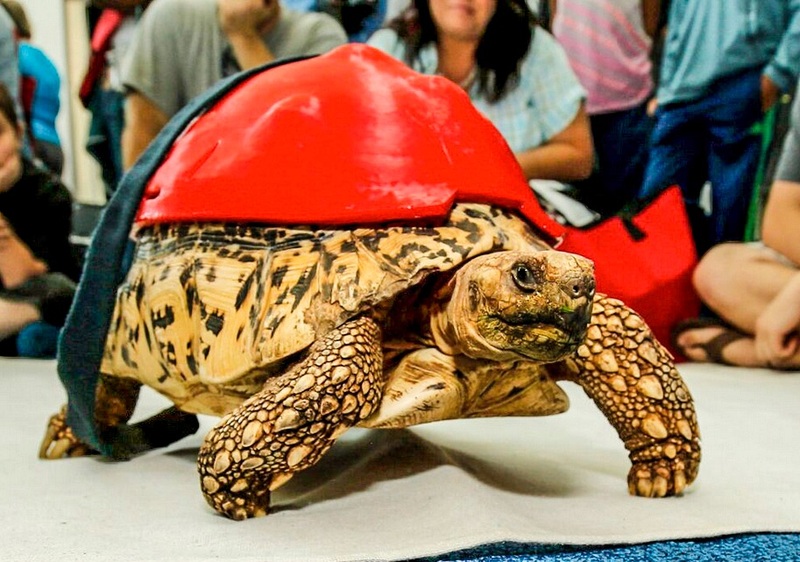 A resilient rescued tortoise with a ruby red shell. Helping Cleopatra was truly a team effort. It all started when Nico Novelli welcomed a struggling tortoise to his rescue, Canyon Critters Rescue. Nico noticed that Cleopatra had a painful metabolic bone disease on her shell called ‘peaking’ or ‘pyramiding’. Due to a poor diet, Cleopatra’s shell was eroding; leaving her vulnerable to disease or infections. Part of the mission of Canyon Critters Rescue is to educate the public on his rescued animals and ways to properly care for reptiles. 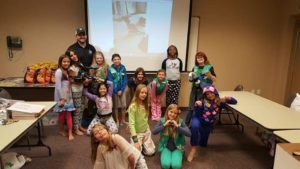 It was through one of his educational presentations to a Boy Scout troop that Nico was propositioned with the idea of a prosthetic shell to help Cleopatra. Not long after, Nico and Dr. Lanka Elson of Colorado Technical University were brainstorming solutions along with her student, Roger Henry. 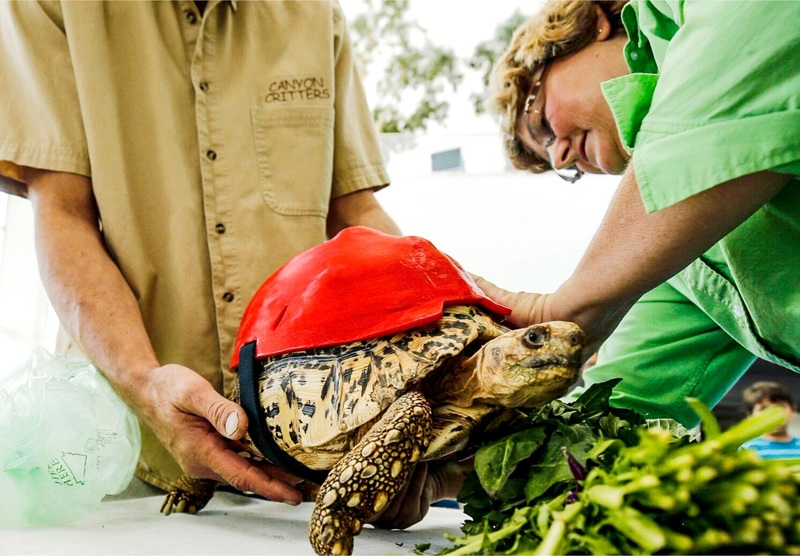 Roger volunteered his time to fashion a shell, allowing Cleopatra to socialize with her tortoise friends in style and reducing her risk of infection while going about a normal tortoise life. 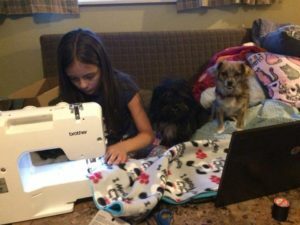 Pawsthetics is proud of their contribution to this ongoing project to fit Cleopatra with a protective shell covering as she thrives and grows at Canyon Critters Rescue. Tortoises are generally expected to live into their 80’s. 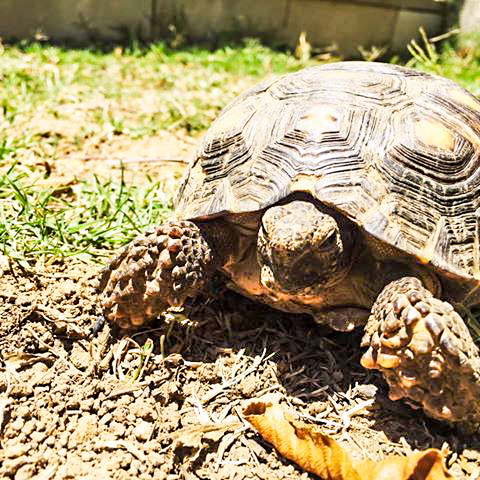 As Cleopatra is only a vivacious teenager, we look forward to re-fitting Cleopatra well into her senior tortoise years. A spunky dachshund that will roll right into your heart. The odds were truly stacked against Tazo when he was dropped off at Animal Haven in April 2015. His medical needs were demanding and his humans couldn’t provide the necessary care for his paralysis any longer. Yet, Tazo’s spirit was bigger than his problems and he became the poster pup for inspiration. Tazo was nominated for the ‘Best Day Ever’ contest featured on Barkpost.com. Several amazing contributors provided their canine services to provide Tazo with a day full of treats, a play date with his puppy pals, swimming therapy and lots of fun! Pawsthetics is proud to have been a part of ‘Tazo’s Best Day Ever’ with their donation of a custom 3D Printed cart that is not only less bulky and light weight for Tazo, but extremely stylish for all of his future dog park dates. Almost immediately after getting his new wheels, Tazo was zipping and turning like a pro. 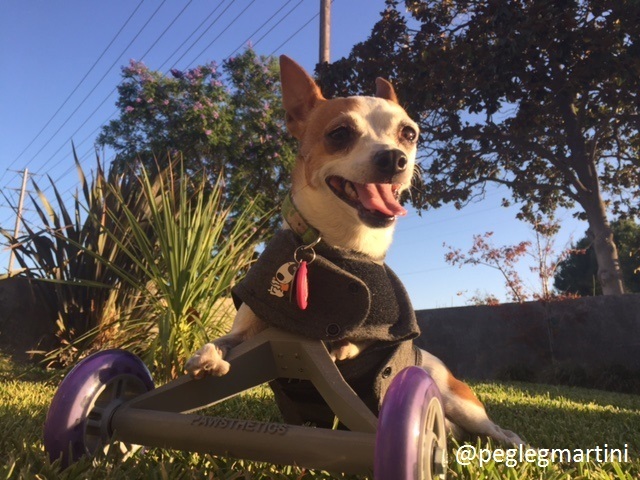 It was apparent that these new wheels gave Tazo the confidence he needed to face his next endeavor – A Forever Home! We are pleased to be working with Dr. Michael Tuma on our next Pawsthetics client; Toby the Tortoise. 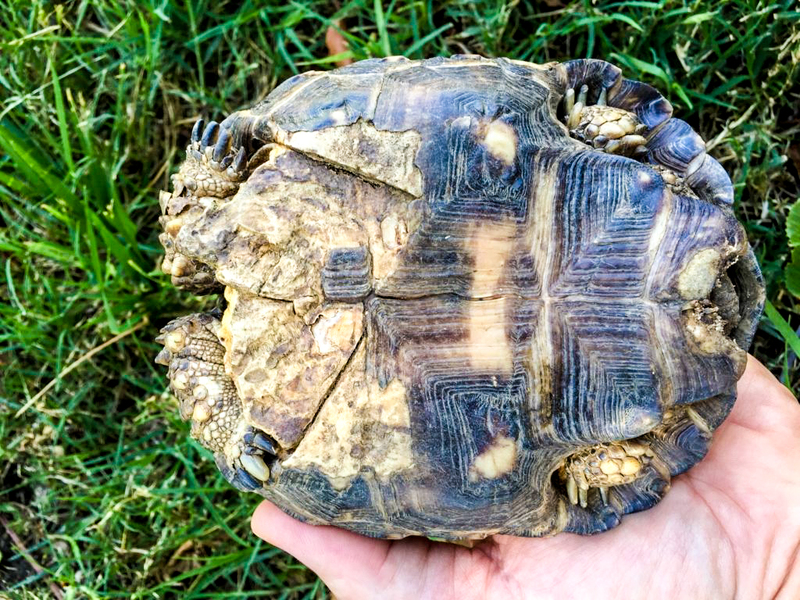 Toby is a Berlandier’s (or Texas) tortoise that suffered a dog attack last year, resulting in damage to his shell and front limbs. Although he has healed from his injuries, he is missing his gular horn, an extension of his plastron (bottom shell). Toby’s keeper Dr. Tuma is a recent graduate from the University of Southern California, where he studied the evolution of gular horns in tortoises. His research helped him to understand that without a gular horn, Toby is at a great disadvantage in interacting with other Berlandier’s tortoises, particularly males. Pawsthetics is working with Michael to develop a 3D-printed gular horn prosthetic for Toby. The prosthetic will be molded to fit Toby’s damaged plastron in a manner that will allow Toby’s shell to continue growing while also providing him with a new gular horn. This should provide Toby with some much-needed confidence when interacting with other male Berlandier’s tortoises, as well as attracting females. 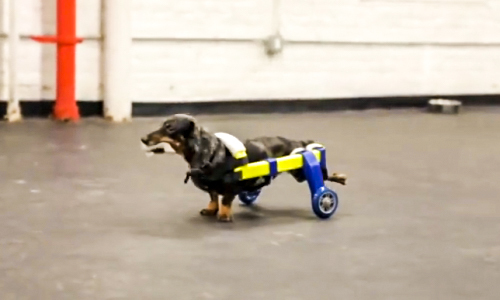 Pawsthetics® Animal Prosthetics in the very near future!